After a tremendous surge through the middle part of the last decade, home prices and homeownership rates have fallen back to where they were a decade ago. At the same time, home affordability, which had collapsed in the mid-2000s, has rocketed back up as interest rates declined to historic lows and home prices fell much more dramatically than incomes. 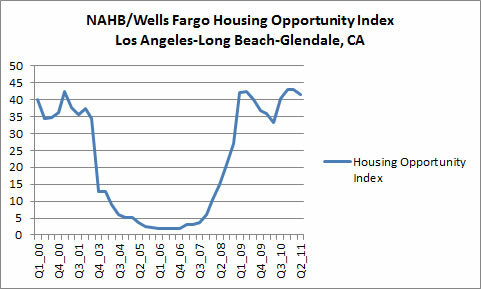 The following graph shows the National Association of Homebuilders/Wells Fargo Housing Opportunity Index (HOI) for Los Angeles-Long Beach-Glendale, CA. Pretty dramatic, isn't it? Looks like a big smile to us. income, using standard mortgage underwriting criteria. It's true that averages don't tell the whole story. Unemployment and continuing structural changes in the economy are still causing many families to struggle to afford a home of their own. But for renters with a stable job and some money saved up for a down payment, it's a great time to buy. If you're already a homeowner and can afford to buy additional homes, it's a great time to invest in residential real estate. With home prices stabilizing and rents increasing again despite the overhang of foreclosed properties, opportunities abound, including the chance to purchase foreclosed properties that are trickling back into the real estate market at bargain prices. It's true that it may be a long time for home prices to make a major move back up, but with rents and prices back in line, rental income can typically cover mortgage payments, which enables landlords to avoid negative cash flow. In short, it's much less risky to own real estate right than it has been for a long time. At today's prices, residential real estate is also a great hedge against the inflation that could result from all the money that the world's central banks have been printing. Buying income properties is a much safer bet than buying gold, which many people have bought as an inflation hedge. In recent years gold has been a great investment even though inflation by and large hasn't shown up yet. Now that gold has already skyrocketed in price, it seems like more of a speculative play these days, like real estate was in 2006. If you are interested in buying a home to live in or are considering investing in residential income properties, the Tad Thormodsgaard South Bay Real Estate team can help you identify and acquire properties that represent good values. We routinely screen all the South Bay foreclosures that come to auction and do in-depth valuations on those that look most promising. We can also manage rental properties for you. Residential properties provide a nice income stream while you wait for the economy and the housing market to take off again. As unemployment decreases and financing becomes more readily available, fear and uncertainty will subside. More and more people will be interested in owning their own home again and homeownership rates will rise. The increased demand for housing, coupled with diminished supply from a lack of new home construction, will one day drive home prices higher, and you will be well positioned to take advantage. Below are some articles that highlight the data on which we based our analysis or that reinforce our general conclusions. If you feel that we've missed something important, be sure to let us know—we're always looking to improve. Would-be buyers are packing open houses and scrambling to make offers on properties before they are even listed. Bidding wars are erupting. National home values rose for the second month in a row, climbing 0.7 percent from March to a Zillow Home Value Index[i] of $147,300. This is the largest monthly increase in home values since January 2006, when they rose 0.8 percent, according to the April Zillow® Real Estate Market Reports. Strength in the market for rentals is beginning to seep into the more troubled owner-occupied sector. Rising rents help housing markets heal on both the supply and demand side, by encouraging renters to consider buying and through the movement of supply into the rental market, easing the glut of houses for sale. Taken together the data are suggestive of a recovery in housing driven by renters. This isn't entirely surprising. New home construction has been at record low levels for several years now, amounting to a shortfall in construction far bigger than the deviation above trend from 2002 to 2006. Meanwhile, America's population has kept on growing. This mismatch has begun to translate into falling rental vacancies and rent increases, which has in turn generated an small but growing upswing in construction of multifamily housing. Regionally, the West led all other areas of the country with its nine-point gain to 21 – the highest HMI score for that region since August of 2007. Today, there's another mortgage crisis in the works—that is, NOT having one—choosing to rent when you can afford to buy; choosing to forgo building equity in a home as a major source of retirement security—something that may be more necessary now than ever before with a soft stock market and low interest rates. The rate of home ownership fell to 65.1% in April 2010, 1.1 percentage points lower than it was in 2000....Home ownership during the 2000s "was really high in the middle of the decade, up to almost 70% at one point around 2004," said Ellen Wilson, a survey statistician with the [U.S. Census Bureau]. The average rate for a 30-year fixed loan dropped to 3.94 percent in the week ended today from 4.01 percent, Freddie Mac said in a statement. That's the lowest in the McLean, Virginia- based company's records dating back to 1971. Yacov Sinai, in Santa Monica, California...got a four-bedroom one-story house in the tony Regent Square neighborhood for $1.87 million last month. Prices in the oceanfront city 20 miles west of Los Angeles may fall another 4 percent to 8 percent, he estimated. Waiting, though, would mean he would have to deal with competition, Sinai said. "Next year, when you make an offer on a property, there'll be another 10 people behind you waiting to get in the door," said Sinai. His new house has four bedrooms, a double garage, and a half-circle driveway. 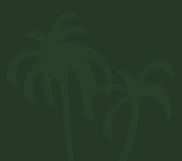 About five years ago, before prices in the Los Angeles metropolitan area tumbled 38 percent, as measured by a Case-Shiller index, Sinai made an offer on a different property in Santa Monica that had several competing bids. The seller required an essay from all potential buyers saying why they should be allowed to purchase it, he said. "It was ludicrous," said Sinai, who lost the writing contest, and the house. In his recent purchase, he negotiated a 12 percent discount off the listing price -- a $267,000 savings -- and he was the only one bidding. Housing affordability hovered near its high during the second quarter of 2011, according to National Association of Home Builders/Wells Fargo Housing Opportunity Index (HOI) data that was recently released. HOI measures the percentage of all new and existing homes sold that were affordable to families earning the area median income. A value of 100 means that a family with the median income has exactly enough income to qualify for a mortgage on a median-priced home, according to the National Association of Realtors. For the 13th consecutive quarter, New York-White Plains-Wayne, N.Y.-N.J., led the nation as the least affordable major housing market, with an HOI of 25.2 percent. Other areas near the bottom of the affordability index included San Francisco-San Mateo-Redwood City, CA (27.5 percent); Santa Ana-Anaheim-Irvine, CA (40.5 percent); Ocean City, N.J. (40.9 percent) and Los Angeles-Long Beach-Glendale, CA (41.6 percent). ...an American economy in which the decline in home construction has apparently overshot dramatically relative to the prior boom. The decline in home construction from 2006 has been unprecedented, and it continues; at the current pace, 2011 would see a record low addition to the housing stock. Meanwhile, the population of working age adults has continued to grow. Pressure in some housing markets (rental markets especially) is beginning to build, translating into rising rents and (in some markets) prices. ...the U.S. is on pace for a record low number of total completions, and the fewest net housing units added to the housing stock, since the Census started tracking completions...Sadly, there are no good, timely data on the likely number of housing units that will be lost to various factors (demolition, conversions, disaster, etc. )...a conservative estimate for 2011 would be in the 250,000 range – implying growth in the housing stock for the calendar year of under 350,000 units. Will housing save America's economy? 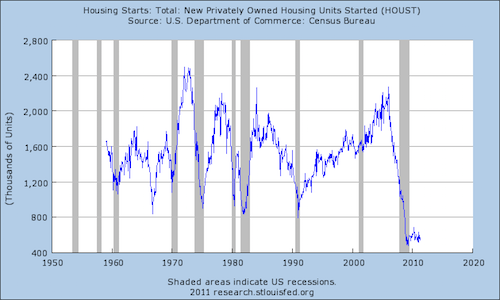 ...housing starts have been at an unprecedentedly low level for a strikingly long period of time. And during that period, America's population has continued to grow. Eventually, whatever the economy is doing, Americans require new houses, new houses mean new construction, and new construction means new employment. Rising rents were one of the factors pushing core inflation higher last month, and increasing rents will soon translate into construction. Since the onset of recession, household growth has fallen short of population growth as families doubled- and tripled-up on housing to economise. 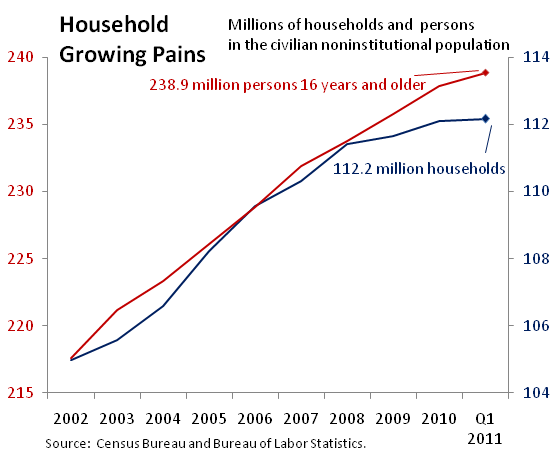 There are now nearly 2m fewer households than one would expect given growth in population. As economic conditions improve, many individuals and families now living with others in order to save money will seek their own homes. That should spark a period of catch-up household growth, which should in turn spark a large rise in rents and new construction. A recovering construction industry would help soak up unemployed workers, continuing a virtuous cycle of recovery.